Other English names: Tare, Spring Vetch. They are transformed into sensitive threads called tendrils, which wind themselves round any object they come in contact with and thus help to support the weak stems of the plant. The leaflets are oblong, square at the end, with a minute narrow point. The flowers are in pairs at the base of the leaves. They have very short or no stalks. They are generally purple to rose-coloured but are sometimes entirely white. The fertilization, like that of pea flowers, is independent of insects, the pistil of a flower being fertilized by the pollen of the same flower. Vetches are seldom cross-fertilized. 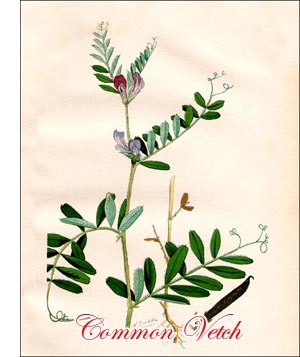 Common Vetch is a native of Europe where it is abundant except in the most northern parts. It is also common in some parts of northern Africa and southwestern Asia. It is not indigenous to North America but has been introduced from Europe. Its value as a forage plant was realized by the old Romans and it is now cultivated all over Europe. In Canada_ it is grown to only a limited extent, principally in southwestern Ontario. Although peas and vetches are closely related, their development is remarkably different. The main stem of the pea plant grows during the whole life of the plant, but the branches are less vigorous. In a vetch the main stem soon stops and strong side branches are developed from the base. In this respect it acts like those plants which start growth late in the season, rest during the winter and finish development the next year. They are called winter annuals and require a period of rest in order to develop properly. With Common Vetch, which is sown in spring on account of its tenderness, the resting period is very short. However, if the first part of the summer is cool, the plant may remain in a typical seedling stage for many weeks, thus proving its relation to winter annuals. Like peas, Common Vetch consists of a great number of varieties, differing from each other in development, flowering time, colour of flower and seed, etc. As fodder for dairy cows, green Common Vetch is highly esteemed for its nutritive value and its quality of increasing milk production. It has long been a common belief that it checks milk production when fed ripe, but late experiments have shown that it has no unfavourable influence on either the quantity or quality of milk produced. The seeds are round and flattened, black in most varieties but grey, white or reddish in others.